Grooveshark is an international online music search engine, music streaming service and music recommendation web software application, allowing users to search for, stream, and upload music that can be played immediately or added to a playlist. An optional paid subscription provides additional functionality and removes advertisements from the user interface. Grooveshark streams 150 to 160 million songs per month. In April 2009, its audience grew at a rate of 2–3% per day. On May 9, 2011, the Grooveshark team did a countdown to 35,000,000 registered users. As of January 2012, Grooveshark employs over 130 people, with nearly 100 working in its headquarters in Gainesville, FL, and additional employees in its New York, NY office. Severe flooding occurred during the 2011 monsoon season in Thailand. Beginning at the end of July triggered by the landfall of Tropical Storm Nock-ten, flooding soon spread through the provinces of Northern, Northeastern and Central Thailand along the Mekong and Chao Phraya river basins. In October floodwaters reached the mouth of the Chao Phraya and inundated parts of the capital city of Bangkok. Flooding persisted in some areas until mid-January 2012, and resulted in a total of 815 deaths (with 3 missing) and 13.6 million people affected. Sixty-five of Thailand's 77 provinces were declared flood disaster zones, and over 20,000 km² of farmland was damaged. The disaster has been described as "the worst flooding yet in terms of the amount of water and people affected. Floodwaters inundated Rojana Industrial Park in Ayutthaya Province, causing extensive damage to the manufacturing industry. Since Thailand is the world's 2nd largest producer of hard disk drives, accounting for approximately 25% of the world's production, a global shortage shortly occurred which sent ripples through the computer industry. Dropbox is a Web-based file hosting service operated by Dropbox, Inc. that uses cloud storage to enable users to store and share files and folders with others across the Internet using file synchronization. It was founded in 2007 by MIT graduates Drew Houston and Arash Ferdowsi as a Y Combinator startup. Dropbox operates on the Freemium financial model. The free Dropbox account comes with 2GB of space that you can use for as long as you like. In the following you will learn how to quickly get up to 24 GB of free space on Dropbox, for life! Windows 8 (codename Windows vNext) is the next version of Microsoft Windows, a family of operating systems produced by Microsoft for use on personal computers, including home and business desktops, laptops, netbooks, tablet PCs, servers, and media center PCs. Microsoft has not yet announced a ship date for Windows 8, although some major media outlets speculate it might be available in late 2012. However, a development build was made available to the public last week. 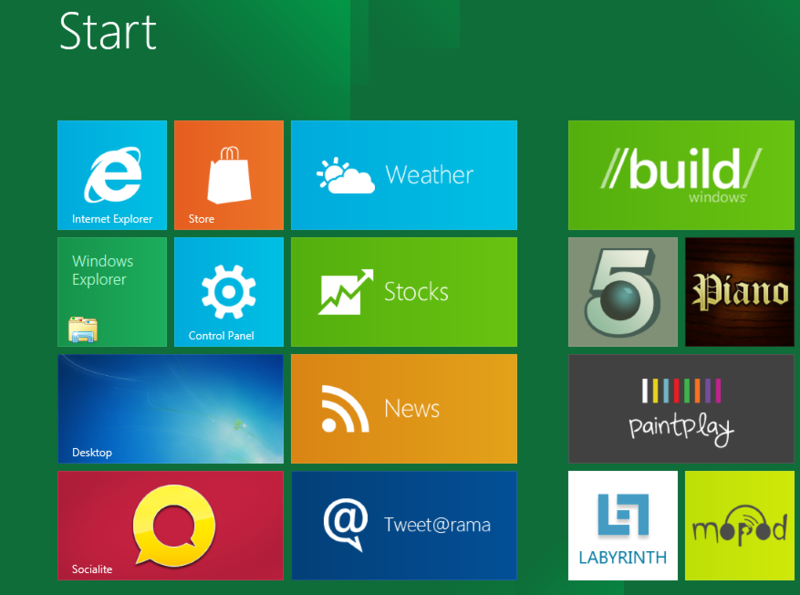 Technophile took Windows 8 for a spin for its money and here is the overview. There's a huge gallery of screen shots and even a short clip waiting for you after the brake. The web is full of hacks that make that preferred browser of yours the fastest thing on the Intertubes. Also, your local ISPs keep spamming your mail box with their latest Internet connection plans. Here's a tutorial to speed up your internet and surf safer without paying extra for it: through DNS! You can read more about improvements to a couple of public DNS services on ArsTechnica and Lifehacker. After the break you will learn a few more things about the top public DNS services as well as how to determine which one best suits your Internet connection. Google Music is an online music streaming service that was announced on 10 May 2011 at the Google I/O conference. The service supports streaming music to desktop browsers and Android phones and tablets, or any other device that can use the Adobe Flash platform. Initially, Music Beta will support storing of up to 20,000 songs for free and Google has suggested that the service will offer a "generous" free package even after Beta. Currently the service is only available through invitation to US residents only. Read after the brake to find out how to benefit freely from Google’s Music offering outside the US. MP3Tunes is an online music backup service, Internet radio, music store and music streaming platform across numerous devices. It recently won an extended lawsuit against a major record label company. The following will explain the ramifications of this event and their importance to cloud services everywhere. In the previous article we’ve established the basics that one needs to know regarding sensors and why cooling is required in your PC. The following will describe what measures to take and when to take them as far as computer thermoregulation goes. You will learn everything there is to know about computer fans, how and where to mount them. It’s summer and if you’re on Technophile chances are that you’re an avid computer user of some sort, be it gamer or geek or something else and you're aware that your favorite piece of electronics can heat up. Today’s article is all about caring for your hardware thermal wise. A lot of the power modern electronics use is outputted as thermal energy or heat. While it won’t generally make the room uncomfortably warm your precious computational machine might have its climatic complaints. The First Part of this article will introduce novices to thermal monitoring of your beloved's insides. In the deep blue ocean of multi-protocol instant messaging clients swims/flies a new fish/bird: Instantbird. What's that you ask? It's what you get when you splice an IM client with Firefox. On October 18th, 2007 Instantbird 0.1 was born. It had about 1,600 downloads on the first day and about 80,000 downloads within the first month of availability. Version 0.3 came out in February 2011 and by the end of June Instantbird matured to a full 1.0 release with 11 locales. After the break read about a rather fresh new take on Instant Messaging. I will be doing a thorough analysis on this relatively new Mozilla powered messaging client which doesn't promise to compete but rather offer users an alternative. Technophile is a blog aimed at geeks and technology enthusiasts. Articles written here will be rather lengthy and thorough. This is my favorite part on the entire Technophile project, so I'll try to include quality material. Posts in this blog will consist of software reviews, tutorials and various analysis on events in the tech world.